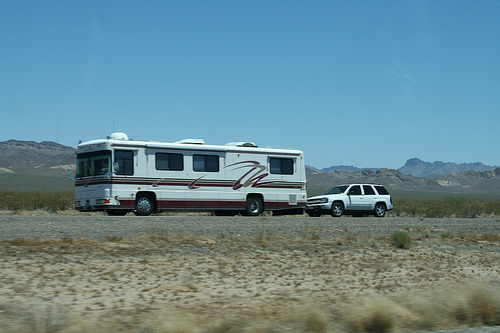 Transportation Costs > How Much Does it Cost to Paint an RV? How Much Does it Cost to Paint an RV? Painting an RV can be a costly decision for many, and when it comes to painting, it’s usually done on older models that need to look new again. On average, the overall cost of a two to four color exterior paint job on an RV is going to cost anywhere from as little as $5,000 to as much as $15,000 for a standard RV longer than 30 feet, and the costs will depend on the length of the RV, the type of paint being used, the geographical location and the professional contractor you’re using. While these prices may seem high, most of the costs will be due to the intensive prep work involved. According to one person who shared his opinion on this forum thread at RVForum.net, the average cost to paint an RV is around $8,000 to $10,000 for a professional job. On this MotorhomeMagazine.com forum thread, a member said he had paid $11,200 to have his 36-foot coach painted. This estimate included a five-color paint with four coats of Dupont Chroma Premier. The estimates above should include the surface preparation, such as scraping, pressure washing, covering woodwork, outlets, and floor surfaces, protecting the customer’s property and removing any external hardware. Before the job starts, the RV will be sanded, primed and then coated with up to three to five coats of paint, on average. This paint will then be covered with a finish coat to protect the paint and provide that new-paint “shine.” Depending on the professional, they may also reseal with new weather stripping, changing the exterior vent covers and/or repaint additional accessories. A multiple-color painting job can increase the estimate by more than 20 percent. If a custom design is required, additional fees can apply. Custom designs can include specific color schemes, designs, such as shapes or stripes, and/or even pictures. Slideouts are often not included in the estimate and can be an additional cost to budget for. Most often, paint fades due to sunlight, pollution, salt, and/or abrasive cleaners, but there is no scientific evidence to prove that certain paint colors fade faster than others. Consider fiberglass instead of a paint job. Fiberglass will not absorb heat in the summer, its finishes are more resistant and is much cheaper, allowing you to save as much as $5,000 when compared to a paint job, according to DoitYourself.com. Limit your graphics and customized finishes. Not only will a customized job cost you more, it can cost you even more in the future if it were to scratch or become damaged since the entire portion would have to be repainted again. As with limiting your graphics and customized finishes, it’s wise to limit your colors as well. The more colors you add to a job, the more it can increase the costs. Weigh the pros and cons of painting an RV. Most of the time, the investment won’t be worth it since it won’t add much in terms of retail value. 99 percent of the time, you won’t be able to recoup your costs. Instead of spending close to $10,000 on a paint job, it may make sense to save the $10,000 and trade your RV into a local dealer.